Taunton, 0 @ King Philip, 4 – Final – After a scoreless first half, King Philip junior Tyler Mann netted a pair of second half goals and Larsen Keys and Nils van den Boogaard each scored once for the Warriors. Mann scored on an assist from Thomas Lugten to open the scoring and then converted a chance from Colby Koch. Larsen Keys earned a penalty kick and took it himself to net his second goal of the season. Senior Nils van den Boogaard netted his first career goal on an assist from Mark Kahaly to cap the scoring. Attleboro, 1 @ Oliver Ames, 3 – Final – Francesca Calabraro, Kiana Lozzi and Abby Reardon were the goal scorers for OA. Milford, 1 @ Foxboro, 3 – Final – Lily Sykes scored the opening goal for the Warriors and Mackenzie Fraser scored twice in the second half, both on assists by Kristen Bortolotti, to lift Foxboro to a fourth straight win. Mansfield, 1 @ Franklin, 0 – Final – Hannah Reiter scored off a corner kick by Emily Vigeant in the second half to give Mansfield the win. North Attleboro, 7 @ Stoughton, 0 – Final – Ashlyn Gaulin scored a pair of goals and Aine Mendonca, Felicity Monfils, Kayla Pasquel, Mackenzie Rosenberg and Leah Jette each netted one goal. King Philip, 2 @ Taunton, 0 – Final – Maddie Smith scored an unassisted goal in the first half to put KP up and Emma Corcoran added an unassisted tally in the second half to double the Warriors’ lead. Attleboro, 1 @ Franklin, 3 – Final – Erin Skidmore led Franklin with seven kills, 11 digs and an ace, Lauren Lockhart added five kills and three digs and Maggie Doyle chipped in with five kills and an ace. Canton, 3 @ Foxboro, 0 – Final – Nine different players registered a kill for Canton in a 25-12, 25-21, 25-12 win. Nicole Poole had 21 assists and 12 digs to lead Canton. “She did a great job distributing the ball to many different hitters,” Canton head coach Pat Cawley said. Erika Lum led Canton with nine kills and combined with Maria Mackie Julia Panico for 34 digs total digs. King Philip, 1 @ Mansfield, 3 – Final – A kill from junior Meg Hill and an ace from senior Jess Haradon gave Mansfield a vital win in game three and the Hornets went on for the win, 25-19, 11-25, 28-26, 25-22. Olivia Broyles had eight blocks, Chloe Peters had 26 assists and five blocks and Hill finished with 10 kills. King Philip’s Sydney Philips had a game-high 19 kills and added 20 service points, Carly Adams chipped in with 24 assists and 23 service points, Amanda Loewen added 11 digs and 12 service points and Liv Balfud finished with 17 service points for the Warriors. Taunton, 1 @ Oliver Ames, 3 – Final – Oliver Ames picked up a 25-16, 25-22, 15-25, 25-23 win behind 38 assists from senior Bridget McCarthy. Alyssa Gavin added 14 digs, a pair of assists, and six aces from the back row, middle hitter Kayla Raymond added 13 kills, Emma Petrillo finished with nine kills, three digs and two aces and Maya Fetcho chipped in with eight kills and two blocks. Stoughton, 3 @ Sharon, 1 – Final – Stoughton junior Val Whalen had an impressive afternoon at the net, recording 17 kills in the win. Christina Gelin and Riley Bagley combined for over 60 digs for the Black Knights. Attleboro, 0 @ Franklin, 7 – Final – Freshman Erin Walsh scored her first career goal and then added three more in the game for a total of four goals. Alex Sullivan had three assists on Walsh’s goales while Brayden Downing had one. Downing also had a goal on an assist from Caroline Jackson, her first varsity point. Sophomore Cassi Ronan added a goal and an assist with Maddie Hinckley and Maeve Ledwith rounding out the scoring with a goal and an assist respectively. Senior goalie Sam Hertzberg picked up the shutout making three saves. Canton, 0 @ Foxboro, 1 – Final – Lily Daly scored the lone goal of the game, putting the Warriors ahead with a second half strike. King Philip, 3 @ Mansfield, 2 – Final – Caitlin Donahue put King Philip ahead with a first half goal off an assist from Alli Meehan. The Hornets responded with a tying goal in the second half but Donahue scored twice more, one off an assist from Christina Hathaway and another from Meehan again. Mansfield scored in the final seconds for its second goal of the game. North Attleboro, 2 @ Milford, 2 – Final – After a scoreless first half, goals from Kaleigh Cole and Julia Feid put North Attleboro up 2-0 but the Scarlet Hawks rallied for a tie. Elena Dello Russo scored with just under eight minutes to play to cut into the deficit and Tina Capone scored with under a minute to play to tie the game. Emily Smith made 12 saves in the cage for Milford. Taunton, 0 @ Oliver Ames, 5 – Final – Five different players each recorded a goal in Oliver Ames’ win over Taunton. Kendall Clifford, Dimitra Efremidis, Meaghan Rockey, Sydney Hedrick and Cristina Boudreau each scored once for OA. Head coach Abby Tepper said Katie Davenport had a strong defensive game for OA. Stoughton, 4 @ Sharon, 1 – Final – Kamryn Oliviera scored a pair of goals for the Black Knights, while Mia Russell and Julia Russell had scored a goal each. Erin Dougherty scored for Sharon. Oliver Ames, 163 @ Attleboro, 185 – Final – Oliver Ames punched its ticket to the state tournament with the win. Thomas Walsh’s round of 40 led the way for the Tigers while Brady Allbritton and Ryan McGarry each shot 41 on the day. North Attleboro, 169 @ King Philip, 180 – Final – North Attleboro’s Robbie Congdon had the match low round of 38 while Sebastian Ladoulis had a team-low round of 42 for King Philip. 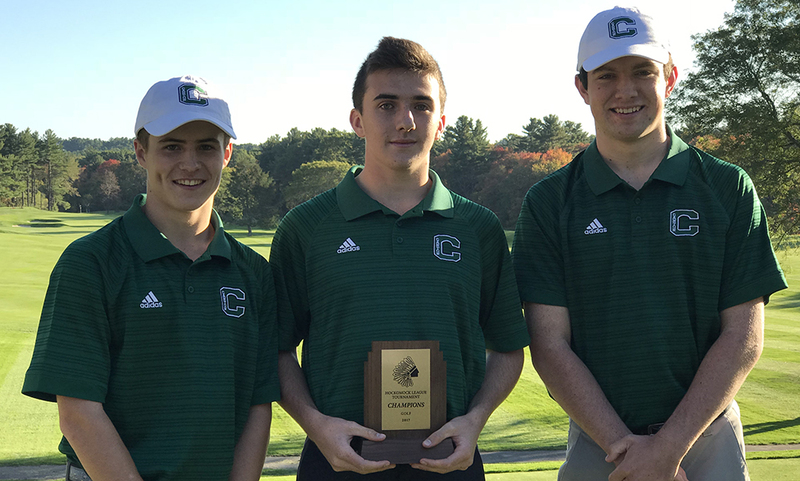 Canton, 161 @ Milford, 153 – Final – Ryan Tomaso was shot a 35 to earn match medalist honors and Anthony Arcudi carded a 36 as the Scarlet Hawks handed Canton its first loss. 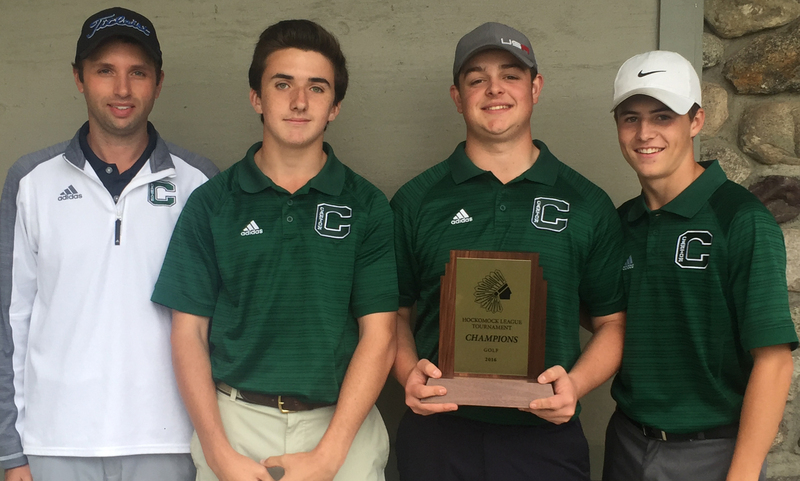 Matt Minichiello shot a 39 for Canton and Danny Powers carded a round of 40. Taunton, 188 @ Mansfield, 165 – Final – Brendan Loomer was the match medalist, shooting a low round of 38 to lead Mansfield. Jason Hindman added a 40 and David Norris shot a 42 on the day. Taunton’s Justin Proto carded a team low round of 40.